Veliko Trojstvo - on <free-bj.hinet.hr/opcina-veliko-trojstvo> is shown a complex quasiheraldical Coat of Arms that I am sure is not approved by the Ministry. 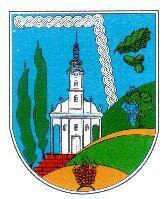 Looking at the official gazettes of the Bjelovar and Bilogora County (at <www.bbz.hr> ), I found out that Veliko Trojstvo adopted a Coat of Arms and the flag, approved by the Central state office for the Administration, as could be concluded from their budget report having the item paid to the office for the act approving the design. (upanijski glasnik BB, 08/2005, p.24). The adopted design is most probably the same as shown on the community web site at <www.veliko-trojstvo.hr> showing the Holy Trinity, the design based on the vitraj (glaswork) in the Church of the Holy Trinity in the town (photo of the vitaj is also on the site). No hint as what the flag would be.